Goodwin Howard Thomas Barnes, son of G S H and Grace M Barnes, graduated as a Flight Lieutenant from RAF Cranwell in April 1917, having been described as a "Very Good Pilot" and a "Very Good Officer". He was posted to a patrol flight at Calshot where he completed a Seaplane course, and was then posted to 353 Sqn at Bembridge where he was described as a "fearless pilot and one who carried out his duties very efficiently". 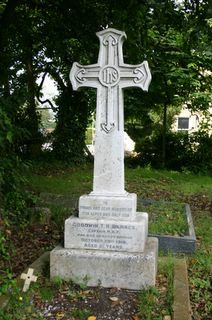 He was buried in Ryde Borough Cemetery with full military honours on 31st October 1918. His death was reported in The Times of 1st November 1918, as being from influenza, aged 21, at Ryde, the only son of the late G Howard Barnes, of Bromley. The London Gazette of 31st December 1918 (issue 31098 p 101) reports that Capt G H T Barnes was Mentioned in Despatches for distinguished services for Coast Patrol.